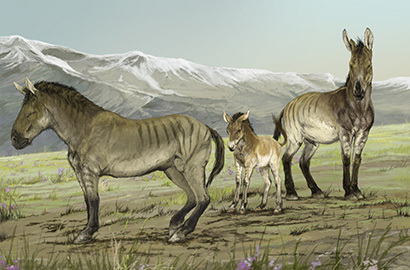 The new findings, published November 28 in the journal eLife, are based on an analysis of ancient DNA from fossils of the enigmatic "New World stilt-legged horse" excavated from sites such as Natural Trap Cave in Wyoming, Gypsum Cave in Nevada, and the Klondike goldfields of Canada’s Yukon Territory. 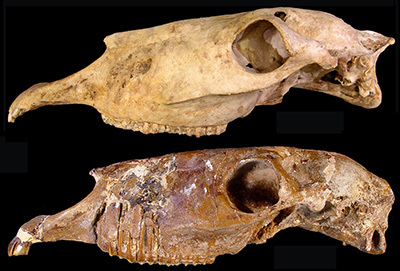 Coauthor Eric Scott, a paleontologist at California State University San Bernardino, said that morphologically, the fossils of Haringtonhippus are not all that different from those of Equus. "But the DNA tells a fascinatingly different story altogether," he said. "That's what is so impressive about these findings. It took getting down to the molecular level to discern this new genus." In addition to Heintzman, Shapiro, Zazula, and Scott, the coauthors include Ross MacPhee at the American Museum of Natural History; James Cahill, Joshua Kapp, and Mathias Stiller at UC Santa Cruz; Brianna McHorse at Harvard University; Matthew Wooller at the University of Alaska Fairbanks; Ludovic Orlando at the Natural History Museum of Denmark; John Southon at UC Irvine; and Duane Froese at the University of Alberta, Edmonton. This work was funded by the National Science Foundation and the Gordon and Betty Moore Foundation.